The project to which this paper refers to had the objective of identifying key indicators of urban environmental performance in Ireland, a country undergoing enormous economic growth, and assessing the feasibility of quantifying the chosen indicators. It is directed at identifying the broad directions of change across a range of variables, so as to inform the sustainability debate. The identification was done by an examination of international practice, and feasibility was assessed by attempting to derive these indicators for 10 cities and towns. The three stages of environmental performance – pressure, state and response were identified where possible. It was hoped to evaluate, compare and establish a baseline for future comparison studies from these indicators. This aim was only fulfilled for some indicators, due to trouble disaggregating national figures for the individual areas. In other cases, there are no data collected and available. Growth in population and income and the associated energy consumption are the main pressures for many indicators. Encouraging alternative energy sources and less dependence on the car as a means of transport are the response indicators that suggest the best sustainable policy for improved air quality and urban health. It is possible to assemble a wide variety of indicators at a very low cost where there are good census data available and a good communication with relevant stakeholders. Combining a number of different urban areas is not much more expensive than doing a single one, and minimises discrepancies for comparison purposes. Ireland's urban areas are unique in Western Europe, in that they are demographically and economically dynamic, and are simultaneously generating, and dealing with, the 'Celtic Tiger'. Ireland's urban areas in this sense stand between the rather static urban areas of Western Europe, and the rapidly growing cities of the developing world. Such demographic and economic dynamism may not be sustainable. A significant proportion of Ireland's population resides in urban areas and therefore the issue of urban environmental quality is of great importance. Although a number of recent policy initiatives have focused at improving the socio-economic conditions of urban areas, many urban environmental problems are still intensifying. Such problems include waste management, aspects of air quality, noise and water pollution, traffic congestion, the loss of open space, and the degradation of the urban landscape. In 1996, the EPA report, State of the Environment in Ireland, recommended that a comprehensive set of environmental and sustainability indicators are developed for Ireland to guide sustainable development and to measure environmental quality and the effectiveness of government policies. Among those suggested for priority was the theme of the urban environment. The Policy Agreement for a Government of Renewal (1994) states the Government's commitment to work towards a new set of indicators of sustainable development, taking account of environmental and social factors, and to be used alongside measures of economic activity such as GDP. A report published by the Irish EPA, Environment in Focus: a discussion document on key national environmental indicators (1999) quantifies indicators (identified in 1998 by the EPA) and focuses on trends in environmental change, the stresses causing them, the impacts resulting from them, and the societal response to prevent and reduce these stresses on the environment. Regarding the availability of data for formulating environmental quality indicators, the 1995 publication by the UCD Environmental Institute, Assessing Sustainability in Ireland (Feehan and Convery, 1995) characterised the situation for a wide variety of sustainability indicators. These ranged from adequate to good in the case of agriculture, solid waste, greenhouse gases and building inventory, poor for issues such as urban areas, transport, energy and non-existent for noise, though with hopes for data resulting from the imposition of EPA guidelines. Where data gaps were highlighted, recommendations were made to address these, so that meaningful information might be generated. This publication also placed the Irish situation in the context of European and international efforts to develop sustainability indicators. A recent report on the state of Europe's environment from the European Environment Agency (EEA) - Europe’s Environment: The Second Assessment (EEA, 1998) - again states that the data for several aspects of the urban environment is still incomplete and inadequate to facilitate comprehensive assessment of the nature and the rate of change. The EEA regards the urban environment as especially worthy of attention because the environmental imprint of cities extends far beyond their boundaries; a reduction of pressures on urban areas not only helps its residents and visitors, but the wider regional and global community as well. Irelands growth in the past decade or so makes the planning towards sustainable development more urgent than ever. The growth in our population over the last thirty years has increased by 28%, and immigration continues to rise. The population of the state is the highest since it's foundation, according to the Central Statistics Office, standing at 3.87 million. In terms of air quality, the total number of motor vehicles continues to rise, from just over 1 million in 1989 to 1,432,330 in 1997, and vehicle usage has also increased. Given the rather limited scope in both time (fifteen months) and resources in this project, it was necessary to confine the study area to a number of urban centres, which would be representative of Irish urban centres in general. The following is a summary of the main bodies and methodologies reviewed, which were used to compile the initial "Indicator Menu" document. International: OECD; EEA; European Commission - DGXI; United States EPA; Australia; The United Kingdom; Canada; USA; World Bank. National: EPA State of the Environment Report for Ireland; Dept. of the Environment – National Sustainability Strategy Report; UCD Environmental Institute; European Foundation for the Improvement of Living and Working Conditions ESRI. Within each theme identified, a range of indicators are listed under the PSR framework, with a priority set identified as being the most suitable and feasible for Irish urban environments. There was a strong emphasis at the data collection stage on both 'top-down' and 'bottom-up' collection. Individual members of the local authorities in each area were consulted at every stage of the process (as a sounding board and source of animation), and supplied statistics that were not nationally available or disaggregated. For other indicators data were collected from the local authorities records and a host of other sources. These included government departments, National Roads Authority, Central Statistics Office, planning documents, Environmental Protection Agency, Garda Síochána, Economic and Social Research Institute and research institutions such as universities. The total projected cost of the project was £60,000 (å76,000, Canadian $108,000), of which an estimated £10,000 (å12,660, Canadian $18,000) was the cost of compiling the data (excluding the noise survey). The most significant specifically urban policy in recent decades in Ireland has been the provision of tax and related incentives to stimulate economic activity in deprived inner urban areas. These urban renewal incentives have affected the volume and mix of investment in the designated zones, and there are associated important indicators of urban performance. 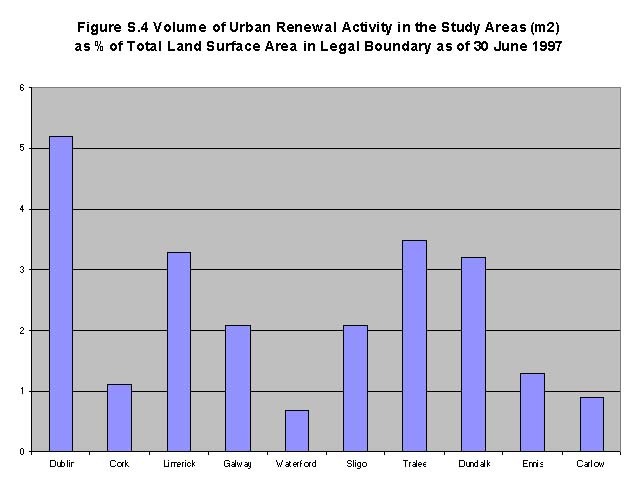 · All ten urban areas (legal boundaries) have experienced growth over the 1991-96 period, ranging from 0.4 per cent in Dundalk to 11.7 per cent in Tralee (CSO, 1991 & 1996). · After decades of decline, the populations of the legal areas of cities and towns have stabilised or risen. · The highest growth rates over 1991-96 are in the ‘environs’ with Tralee (40.3 per cent) and Carlow (18.0 per cent) being especially notable (CSO, 1991 & 1996). · There has been large growth in number of new houses built, with the rate more than doubling from 1988 to 1998 in all urban areas (Household Survey). · The urban renewal incentives have directed a large volume of investment into the designated areas, with £1.7 billion in total being invested and approximately 1.7 million m2 created, with Dublin the leading urban area in terms of volume (due to the Temple Bar and Docklands developments) (KPMG, 1996). · The extent of dereliction is very low overall, with Limerick (1.25%) and Dublin (0.8%) having most, but this may be a product of differing standards in definition (Sources: Various local authorities). 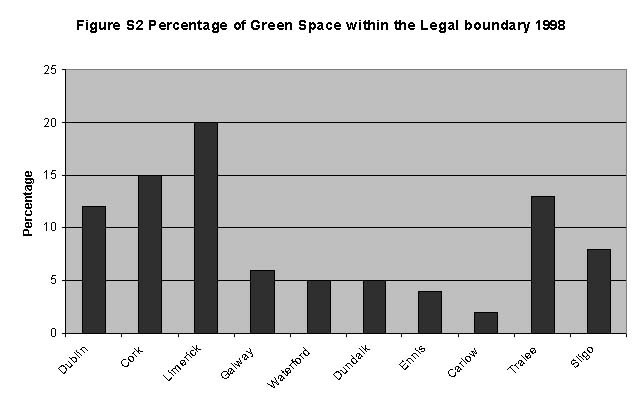 · Limerick and Cork have the highest percentage of green space, with 20% and 15% respectively of total land within the legal boundary being categorised as green space, and Carlow (2%) has the lowest. Despite a declining birth rate, there are an increasing number of households being formed in Ireland due to the rising affluence of society, and immigration. As more young people enter the labour market and seek a new home, greater pressures will be exerted on areas such as physical infrastructure in our urban centres. Agricultural land surrounding our urban centres and green spaces within them will be particularly vulnerable to the increase in demand for residential lands. A clear distinction can be made between growth within our urban centres and growth on the periphery of these centres. For the success of urban renewal policies, it is important that growth is observed within the urban boundaries. Certain trends are revealed by analysing the Census of Population figures for the years immediately prior to the initiation of the schemes as well as the census figures available following the introduction of urban renewal in Ireland. It is possible to assess whether or not the desired goal of population growth within the inner urban area has been achieved. Whilst urban renewal policies use the construction of new buildings on derelict or obsolete land and the recycling of old buildings through refurbishment to attract people, businesses and life back into our decaying urban centres, it is important that regeneration policies do not compromise the quality of the green environment present in these centres. People need open areas of unbuilt land close to the urban core for both recreation and health. As our urban centres continue to expand outwards, the value of any existing public open spaces increases. As an indicator, it is important that each urban area observes either a stabilisation or an increase in the proportion of the total land area of the town or city devoted to open space. An attractive green environment is essential to attract people back into the city centre. The provision of such areas is not only essential for the health and recreation of the urban inhabitants, it can also lead to aesthetic improvements of the urban landscape, thus green areas should be considered as viable options for any infill or renewal proposals within the urban area. In situations of high density housing, gardens are less common, and it is essential that inhabitants have access to public recreation areas. There are a number of reasons for showing concern over the proportion of urban renewal projects that involve either new buildings or refurbishment. The construction of buildings can have either a positive or negative effect on the urban environment, which makes it somewhat different from other sectors. The negative effect arises when new buildings intrude upon the existing built environment because their size or style is not in keeping with other buildings in the area. The demolition of an existing structure which has appealing architectural or historical features, and its replacement with a less appealing structure represents a double intrusion (KPMG, 1996). Therefore, in order to encourage refurbishments rather than new construction, a favourable tax treatment should be available. The Department of the Environment stated clearly when the 1994 Urban Renewal Schemes were launched, that it is the aim of the urban renewal programme to retain the character and soul of towns and cities by maintaining physical links with the past (DoE, 1994). Buildings of merit, buildings that are an integral part of streetscapes and landmark buildings should all be restored where possible. Despite the strong emphasis on refurbishing the existing building stock, new constructions still dominate projects in designated areas. However, some new constructions created buildings where only vacant sites and derelict buildings existed before. These new constructions were essential to achieve the broader aims of urban regeneration, i.e., attracting people and businesses back into the area, together with improvements to the urban environment. A certain degree of refurbishments were carried out on any interesting or structurally sound buildings within the designated areas. It is more beneficial, in general, to promote refurbishments wherever possible in designated areas, and although the number of projects undertaken can never be expected to match that of new construction, an increase in this number will provide a valuable indicator as to our progress in retaining the existing character and fabric of each individual urban area. 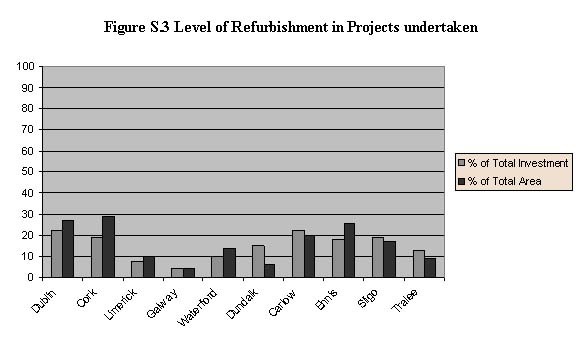 The total volume of building completed under the Urban Renewal Schemes can be seen as an indicator of the success of the schemes and the willingness of local authorities to avail of the schemes. Theoretically, the higher the volume of building completed in the town and city centres, the more attractive they become for living, working and recreational purposes. 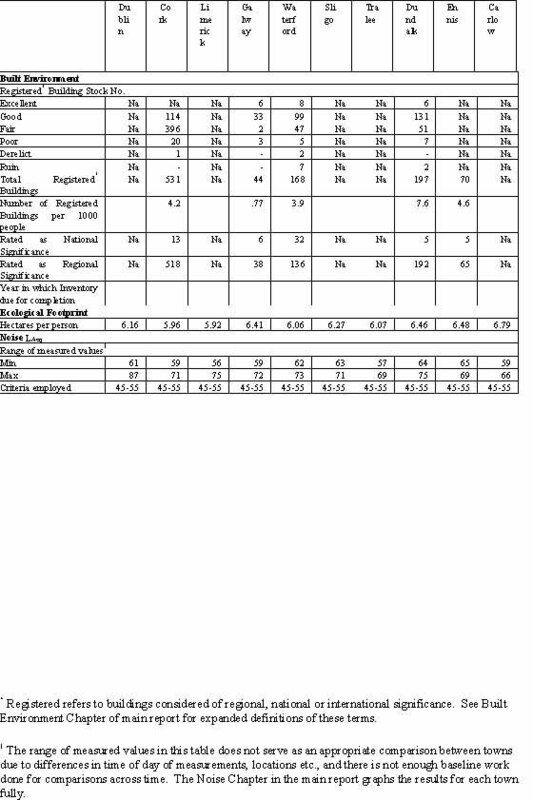 The actual total volume of the projects is recorded in Appendix 1, Table AI.1, and figure S.4 below shows these figures as a percentage of the total areas in the towns and cities. · Tralee (41.89%), Sligo (39.9%), Carlow (39.8%) and Galway (39.24%) had the highest proportion of trips to work by walking and cycling in 1996. Ennis (22.99%) and Dublin (27.67%) had the lowest (CSO, 1996). 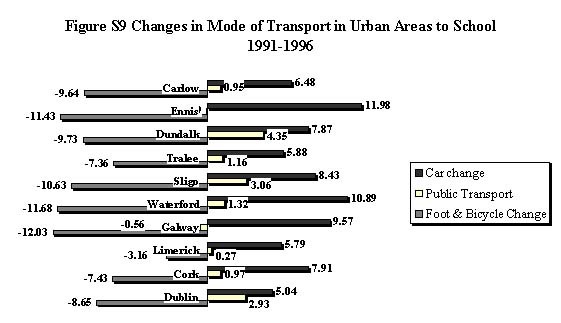 · The trend of non motor mobility is downward, with the proportion walking and cycling falling over the 1991-’96 period for all urban areas (the largest fall being Carlow, at 4.09%) except for very small growth in Cork (0.99%), Limerick (0.12%) and Tralee (1.22%) (CSO, 1991 & 1996). · Ennis (49.6%), Dundalk (41.94%) and Waterford (39.8%) are the most car dependent on car driver trips in 1996. All 10 urban areas show increasing dependency on car driver trips over the 1991-96 period, with the greatest growth in Ennis (4.69%), Sligo (4.48%) and Limerick (4.02%) (CSO, 1991 & 1996). · The people of Ennis have dramatically longer trips to work and college, with 32.35% of such trips longer than 10 miles. The proportion of such longer trips is also growing in all urban areas, with the growth especially pronounced in Ennis (4.69%), Sligo (4.48%) and Limerick (4.02%) (CSO, 1991 & 1996). 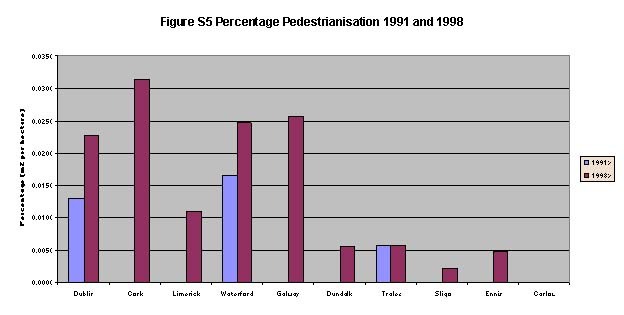 · Dublin (27,000 m2) and Galway (13,000 m2) have pedestrianised most, with Carlow (0 m2) and Ennis (250 m2) doing least in this regard (The relevant local authorities supplied this data). · Dublin (39 km), Cork (9 km) and Galway (8.7 km) have done most in regard to length of cycle way, while Carlow, Ennis, Waterford and Limerick have provided none (The relevant local authorities supplied this data). · Dublin has the highest number of taxi and hackney licences issued (9.3 per 1,000 people) while Dundalk has the lowest (2.9 per 1,000 people). In terms of car-parking spaces, Dundalk had the most (137 per 1,000 people) and Cork has the least (43 per 1,000) (The relevant local authorities supplied this data). Information on the extent of areas pedestrianised was obtained from each of the relevant urban authorities. This is potentially an important response as measures to improve the attractiveness of walking could greatly contribute to a modal shift. This indicator examined the extent of city areas pedestrianised. It is concerned only with the conversion of traffic ways to pedestrian ways. A significant proportion of the urban population travels between two and four miles to work every day, and yet only a small percentage undertakes this journey by bike. Improving the safety and attractiveness for cyclists could lead to a modal shift. Such measures would include providing special paths/lanes, safe parking facilities, shortcuts and underground passes or bridges to overcome obstacles such as rivers, rail tracks or motorways. Information on the length of cycle paths was obtained from each of the relevant urban authorities. Figure S6 below shows the km of cycle ways per 1,000 hectares of area in each of the cities and towns. The choice of mode of transport for commuters clearly determines the type of impact made on the environment. The most prevalent mode of transport for travelling to work and college in each local authority is the private car, catering for between 31% of the population in Dublin, to 49% of the population in Ennis. Regarding transport to school, the most prevalent mode is generally by foot or bicycle, but travel by car is increasing. Appendix I, table AI.3 summarises some key environmental quality indicators. Although Ireland performs satisfactorily in terms of guide values on most indicators, it should be kept in mind that the standards are likely to get more stringent in the future. · Energy consumption can be seen as the main pressure on all aspects of environmental quality. The resulting emissions are responsible for increases in acidification, climate change and deterioration of air quality. · The levels of smoke and SO2 in the air have decreased dramatically in Dublin with the legislation for smokeless and low sulphur fuels, and similar situations would be expected in the other urban areas as these measures are introduced. All are below the guide values presently (EPA, 1997). · Most air quality data is only collected for Dublin, or in some cases Cork, so there is no way at present of telling how the other towns and cities are doing in relation to the EU Guide values. · Regarding NO2, Dublin is above the EU guide in its average monthly Summary results for 1997 (EPA 1998). · Average CO levels for Dublin and Cork are below the WHO guide value (EPA, 1998; Air Pollution in Cork City 1998 Report). · Lead levels in Dublin are found to be low - this is a vast improvement on the past and can be attributed to the introduction and widespread use of unleaded petrol (EPA, 1998). · As there is no standard set presently for PM10s it is difficult to evaluate Ireland's standing. However, standards have been proposed and it appears that the Irish readings may exceed these for certain areas. · Water Conservation Schemes (mainly dealing with leakage from underground pipes) are in place in all the urban areas studied except Sligo, Ennis, Dundalk and Carlow. · Resource use and waste generation have accelerated alongside population growth and increased technology. There is neither sufficient land nor facilities within the urban boundaries to cater for all of the waste generated. Regarding litter, Galway had the highest number of litter fines and Tralee the least, but Tralee reported 100% payment of these fines, while Sligo had the lowest payment percentage at 19%. Cork and Galway have the most bring back facilities for recycling and Limerick reports the highest rate of recycling of waste at 18%. (EPA National Waste Database, 1999; local authority data). Increasing emphasis is being focused on water quality issues, both nationally, and at the international level. Over the last decade the length of river classified as unpolluted has dropped from 77.3 per cent to 66.9 per cent and this is attributed in the main to nutrient enrichment or eutrophication (EPA, 1999). The enrichment of fresh water bodies with nitrogen or phosphates can cause plants and algae to increase unnaturally, thus affecting the dissolved oxygen required in the water for other species. Coastal areas tend to be subject to contamination from organic wastes (EEA, 1998). Internationally, water consumption has been used as an indicator of driving force. 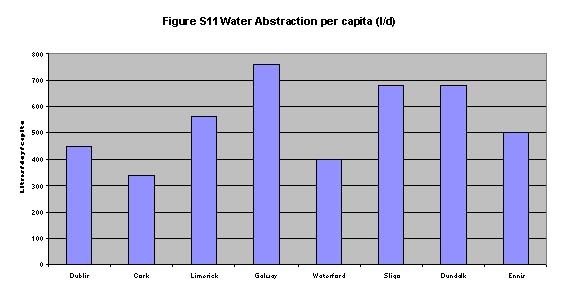 Figure S11 shows water abstraction per capita per day for each of the urban areas where these figures were available. The main pressure indicator for Smoke and Sulphur Dioxide is the burning of fossil fuels such as coal, oil and peat, in the domestic, industrial and transport sectors. As population and housing units increase, fuel and energy consumption rise. Open fires in homes are a major source of much of the particulate material emitted to air as smoke. Results for the ten urban locations show that ambient air concentrations for smoke and SO2 are very low in comparison to WHO guidelines (Figure S12 and Table AI.3, Appendix I). Higher values for Limerick and Dublin (where low sulphur fuels are burned) may be the result of emissions from the power generation plants in the vicinity of the urban areas. · Comprehensive data are available only for Ennis. Waterford and Dundalk have complete data for all the buildings rated as significant in regional, national and international categories but no baseline figures (i.e., total building numbers against which to compare registered buildings). This situation is true for Cork and Galway, except that the inventories for these cities omit certain geographical sections. · Dundalk dominates in terms of number of buildings considered by the NIAH survey to be in good condition (131 out of 197 registered buildings), followed by Cork (114 out of 531 registered). · Cork has a very large stock (396 out of 531 registered) in ‘fair’ condition. · The number of derelict registered properties is small – one in Cork and two in Waterford. · The National Inventory of Architectural Heritage is due for completion in 2011 for the whole country, registering and describing the character of each building, giving all buildings a registration number, and making the development of built environment indicators for all urban areas possible. 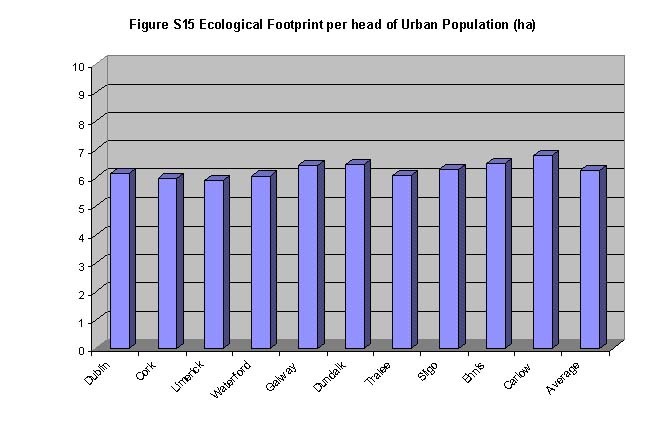 · The ecological footprint does not vary greatly from urban area to urban area, (because the coefficients which make up the foot print are based on international and national coefficients which do not differ between towns, except in the case of shelter and transportation), with the minimum and maximum being Limerick (5.96 ha per person) and Carlow (6.79 ha per person) respectively. · Examination of the survey data on noise compiled for the ten urban locations reveals that the majority of results fall into the range 60 to 70 dB LAeq. * The measured values are generally in excess of the noise level criteria that are employed for the purposes of assessing noise complaint, i.e. 45 to 55 dB LAeq. Whilst it should be acknowledged that very few of the measurement locations were in close proximity to residential properties, this would seem to suggest that complaints do not arise as a result of an accumulation of noise from many different sources. Rather, complaints tend to be directed at specific sources of noise that are more readily identifiable, the level, character or intermittency of which are sufficient to give rise to disturbance. This type of consideration may be part of the reasoning behind the EU’s current plans to consider dose and exposure. This indicator aims to rate the condition of buildings against total building stock numbers in order to see whether the quality of the building stock in an area is being maintained or declining. It is particularly important in relation to rated and listed buildings and how they are being conserved. For the purposes of the current project, the data available is limited to those buildings, which are rated as being of regional, national or international significance for four towns in full, and cannot be set against total building stock figures, even within the context of the NIAH’s records. The Ennis database did not include the condition category. A potential problem arises when the condition of a building is set against the age of the structure. In the Ruin category there occurs National Monuments, which are maintained in a sound, stable condition, and are not as such decrepit structures, even though they may technically be "in ruins". National Monuments are identified in a separate field in the NIAH data. These monuments would have to be signposted to allow for them to be filtered out of the relevant category. *Registered Buildings refers to buildings of regional, national and international significance included on the register for the four towns. There is increasing recognition of unsustainable pressures on the earth's carrying capacity, including intensive exploitation and depletion of natural resources and the growth in consumption and production. Society's ecological footprint, an indicator developed to illustrate human impact on a finite planet, underlines the dilemma now facing Ireland as part of the global community. A footprint represents the corresponding area of productive land and aquatic ecosystems required to produce the resources used and to assimilate the wastes produced by a defined population at a specified material living standard. The Ecological Footprint can be calculated at many levels in many sectors: for example, the footprint of a single business could be calculated. It can also be adapted by various sectors in the economy to be used for budget reviews, technology and policy assessments to detect whether initiatives are moving toward sustainability or merely 'sustainable posing'. The usefulness of this tool depends on the levels of information about ecosystems affected by each consumption item used - if there is little information then the footprint will be a poor reflection of the true impact of the area under study on the environment. The footprint is a useful sustainability indicator combining the three desired elements of an indicator - policy steering, transparency and ease of communication. · Growth in population and income and the associated energy consumption are the main pressures for many indicators. However, the move to cleaner domestic fuels, lead-free petrol, catalytic converters and increasing policy implementation has resulted in an improvement of air quality in terms of lead, smoke and SO2 in urban areas in Ireland. Conversely, the increases in the number and size of cars may be outweighing the benefits of cleaner fuels. Encouraging the use of alternative energy sources and less dependence on the car as a means of transport are the response indicators that suggest the best sustainable policy for improved air quality and urban health. · This exercise also had the benefit of highlighting gaps in the data availability and it would be hoped that follow-on indicators reports would show more comprehensive results, particularly regarding the indicators of environmental quality, which have a direct impact on human health. Most of the Irish national data is driven by the need to comply with EU Directives. The only specifically urban 'driver' in this respect is Agenda 21, and this explains the incomplete nature of what has happened at local level so far. · The noise levels in the ten towns and cities were found to be generally higher than recommended and are mainly due to traffic, construction and entertainment venues. · It was hoped to measure the extent of re-population of the inner urban locations under the Urban Renewal Schemes, but specific population statistics for the areas covered were not available. It was found, however, that new construction still dominates refurbishments, a significant percentage of land is derelict and the mix of investment across the sectors (residential, office, commercial etc.) varies widely from urban area to urban area. · The Ecological Footprint, as a concept, provides an interesting dissemination document, but its main use is as a comparison between countries, not as a comparison of urban areas within a specific country or across time. · Areas highlighted by the literature review, and the subsequent chosen indicators closely match those recently prioritised by the latest technical report by the Working Group on Measuring, Monitoring and Evaluation in Local Sustainability, Expert Group on the Urban Environment (EC, 2000), which lists amongst the core indicators: Local mobility and passenger transportation; availability of local public green areas; quality of local outdoor air; children's journeys to and from school; and noise pollution. Table AI.3 Key Environmental Quality Indicators. Table AI.4 Built Endowment, Noise and Footprint. *LAeq is the equivalent continuous sound level - the weighted decibel value (a means of expressing sound pressure level in a manner which takes into account the non-linearity of human hearing) level of a notionally steady sound having the same energy as a fluctuating sound over a specified measurement period. It is effectively a type of average. Central Statistics Office. 1997: Census of Population, 1991: Volume 11: Travel to Work, School and College, Stationery Office, Dublin. Central Statistics Office. 1998: Census of Population, 1996: Volume 6: Travel to Work, School and College, Stationery Office, Dublin. Convery, F. 1998. Large Scale Out-of-Town Shopping Developments in Ireland - Issues and Choices. Musgrave Group, Cork. Department of the Environment, Ireland 1997: Sustainable Development: A Strategy for Ireland, Government Publications. Department of the Environment 1997. Ireland Climate Change CO2 Abatement. Government Publications. Department of the Environment and Local Government 1997: Irish Bulletin of Vehicle and Driver Statistics 1997, Brunswick Press Lt.
Department of the Environment and Local Government, 1997. Inventory of Public Roads in Ireland as at 31 December 1997 (kms). Government Publications. Department of the Environment and Local Government, 1998. Policy Statement on Waste Management, Changing our Ways. Department of the Environment and Local Government, Dublin. Department of the Environment, Sport and Territories (DEST) (1994) State of the Environment Reporting: Framework for Australia, DEST, Canberra. Ennis Urban District Council 1996: Ennis Traffic Review 1995/1996, Nov. 96. European Environmental Agency, 1997. Towards Sustainable Development for local Authorities - Approaches, Experiences and Sources. Institute for Environment and Systems Analysis (IMSA Amsterdam), The Netherlands. EPA, 1995. Air Pollutants in Ireland. Emissions, Depositions and Concentrations 1984-1994. Environmental Protection Agency, Ireland. 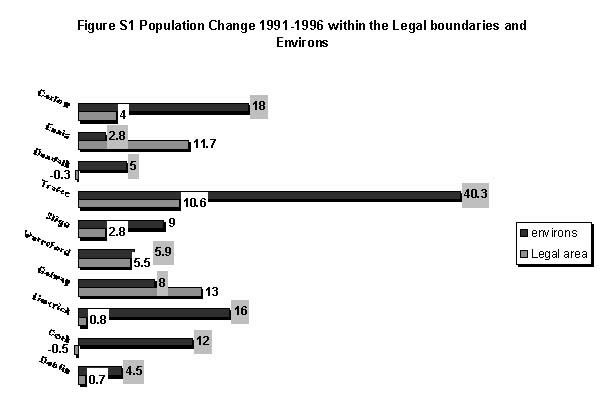 EPA, 1996: State of the Environment in Ireland. Environmental Protection Agency, Ireland. EPA, 1997. A Baselines Study in the Concentrations of VOC's and PM10's in Dublin City. Environmental Protection Agency, Ireland. EPA, 1998. Air Quality Monitoring Annual Report, 1997. Environmental Protection Agency, Ireland. EPA, 1999. Water Quality in Ireland 1995-1997. Environmental Protection Agency, Ireland. EPA, 1999. Measuring Progress Towards Sustainable Development: a discussion document. Environmental Protection Agency, Ireland. EPA, 1999. Proposed National Hazardous Waste Management Plan. Environmental Protection Agency, Ireland. Government Report 1999. Planning and Development Bill 1999. Government Publications Sale Office, Dublin. KPMG, 1996. Study on the Urban Renewal Schemes. Department of the Environment. National Inventory of Architechteral Heritage, 1997. Ennis 1997 Text Database. Duchas The Heritage Agency, Dublin. National Roads Authority, 1998. Review and Programme for 1999. OECD, 1997. Better Understanding our Cities: The Role of Urban Indicators, OECD, Paris. Sligo Corporation Integrated Action Plan, 1999.